It's so easy to use I didn't even have to ask Mr. MontebelloMom for help. 1. Attach the included mosquito attractant to the bottom of the unit, hang it the yard, and plug it in. 2. The glowing blue light attracts bugs who like lights, and the chemicals in the mosquito attractant lure mosquitos to the unit. 3. When the bugs touch the light it zaps them, and they die. 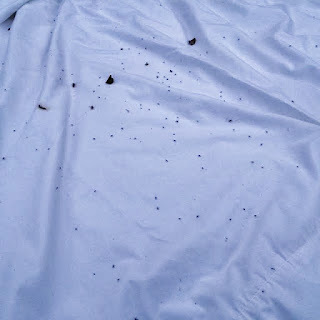 I placed a white sheet under the bug zapper and this is what I found in the morning. "yellow fever" mosquitos in Montebello. I've taken preventative measures, but my family is covered with mosquito bites. We find new bites before the old ones have healed. I'm hoping that by taking these mosquitos out of the population there will be less eggs laid, and less mosquitos in our backyard. 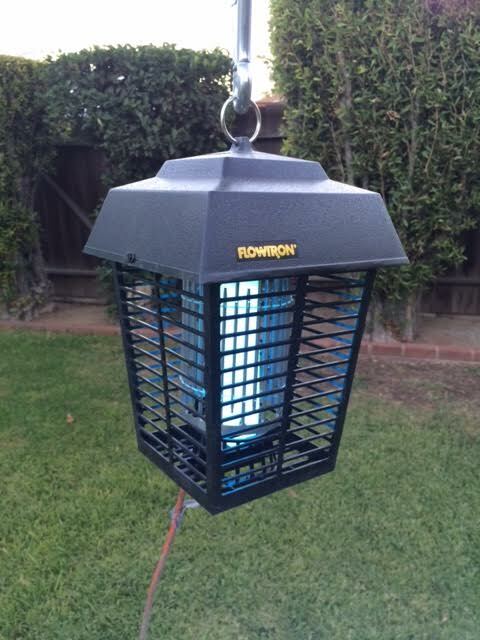 If you purchase a bug zapper via the links above MontebelloMom will get a small commission (4%) from Amazon, at no additional charge to you. The reviews from amazon of this electronic insect killer are excellent, and I can attest that it works in Montebello. Flowtron BK-15D Electronic Insect Killer. Donate 5 Canned Goods & Join the YMCA for free!